Slip Slidin' Away is the sixth level of World 4 in Yoshi's Island DS. The slippery ice makes it hard for Yoshi to stay on the ground. In the first area, Yoshi must have Baby Peach on his back, so that he can ride the wind. Yoshi needs to hit the Winged Cloud to activate the stairs. 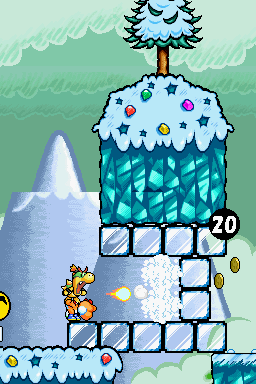 In the next area, Baby Bowser must be riding Yoshi in order to melt the blocks of ice that prevent Yoshi from advancing. Then, Yoshi must jump while avoiding several Wild Ptooie Piranhas. In the last area, Yoshi needs to jump while avoiding the Gusty and the Item Balloon. After this, Yoshi reaches the goal roulette and the level ends.